YACHT PARTIES IN NY - NY'S HOTTEST – YACHT NIGHT PARTY NYC HALLOWEEN BOAT PARTY CRUISE! NYC HALLOWEEN BOAT PARTIES, HALLOWEEN NYC BOAT CRUISE! 1 DAY - 1 EXCLUSIVE EVENT! MUSIC BY NYC HOTTEST DJS AT SKYPORT MARINA JEWEL YACHT PARTY, NEW YORK!! Boarding Starts at 11:45pm (highly recommend getting there at 10:00pm to avoid long lines & confusion), Sails at Midnight. Boat Returns at approximately 4am. Skyport Marina Jewel Yacht Dress Code: Its Halloween! Be Creative! 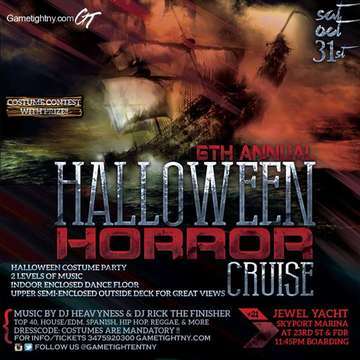 NYC HALLOWEEN HORROR BOAT PARTY CRUISE AT THE JEWEL YACHT AT SKYPORT MARINA!